6.6 miles Summer hiking tour to the chapel „Silvesterkirchl"
You're facing an uphill climb of 7474 vertical meters on this hike. This is quite much. You should be fit to do this track. This makes the hike one of the 5 hikes with the most ascent in Austria. The high point of the hike is located at an elevation of 8566 ft.
Carnic High Route Sillian - Arnoldstein is the the best rated hike in Austria. With an overall length of 100 miles the hike is currently the longest hike in Austria available on TouriSpo. The Karnische Höhenweg (“Carnic high-level route”, path no. 403) is some 155 kilometres in length, passing 11 huts and 30 peaks along the way. The individual stages from Sillian to Arnoldstein can be split into six to nine one-day tours depending on your level of fitness and the time available. If you start the route in Sillian, you’ll first have to take to high-level paths largely running above 2,000 metres in a landscape dominated by craggy limestone rock. After the Plöckenpass, the paths become gentler, leading through idyllic meadows and forests. It goes without saying that you can also walk the path in the other direction. The individual stages offer incredible insights into the diverse natural surroundings of the 110-kilometre Carnic Main Crest, which runs in an east-west direction along the border between Austria and Italy. The tour is also known as the “path of peace” – paying testament to the fact that this area was fiercely contested during the First World War with numerous soldiers losing their lives here. From 1974 onwards, the partially destroyed walking paths in the region were repaired, paving the way for it to become a favourite with walkers from all over the globe nowadays. Starting in Sillian, a forestry road climbs up to the Leckfeldalm at 1,900 metres. From there, you cross the Leckfeldsattel to the Sillianer Hütte, which offers breath-taking views over the Sexten Dolomites. From here, continue along the main crest eastwards. The route then crosses the Hollbrucker Spitze, Hochgrätenjoch and Demut. This is followed by a climb up to the highest point on the route – the 2,665 metre Eisenreich. The effort is rewarded with views of the Dolomites and Großglockner Group. 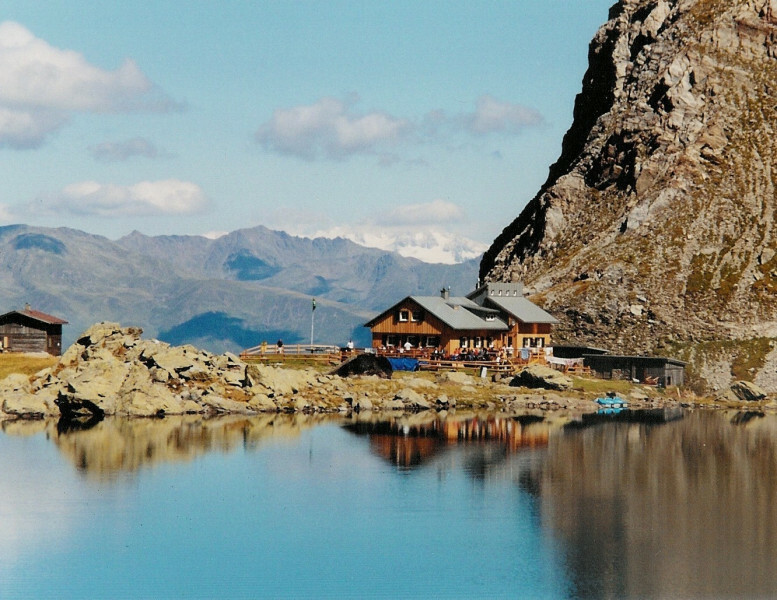 You’ll finally reach the Obstansersee Hütte after descending to a lower level. From the hut, the route heads south up to the Obstanser Sattel, where the path crosses the ridge before approaching the Pfannspitze. The path then heads on to the Kleiner Kinigat which then links to the Großer Kinigat via a fixed rope route. If you’d prefer a more leisurely approach, you can skirt around the Großer Kinigat via a scree field to the south. The route then passes the Filmoorhütte and circumnavigates the Obere Stuckensee through the Rosskar to the Porzehütte. The path sets out from the Porzehütte over mountain pastures towards the Obertillianer Joch. A gentle ascent from here then ascends to the Bärenbadegg. The path continues on to the Kesselscharte and along the main crest via the Reiterkarspitze to the Hochspitzsenke. Passing to the south of the Hochspitz, the Steinkarspitz is the next peak on route. The path then heads for the Luggauer Törl before continuing on to the Hochweißsteinhaus. The stage begins with an ascent up to the Öfnerjoch. The path then leads over the forested southern flank of the main crest through the Val Fleons and up to the Giramondopass. From here, the route plunges down to the Oberen Wolayeralm. A gravel track then links to the Birnbaumer Törl and the Wolayersee Hütte. You pass Hohen Warte as you head north around the lake. The path then descends down towards Valentinstörl and then on to the Valentinsalm. The route then follows the Plöckenpass-Straße heading south until the Museumsweg junction. Along the main crest (path 401) you then pass former fortifications before taking path 402 to Lago Avostanis. The route then descends down Fahrstraße, until path 448 heads off to the left. The tour then scales Monte Scarniz as well as Hohen and Kleinen Trieb. From here, it’s not far to reach the Zollnersee-Hütte. The leisurely path 403 first leads to the Kordinsattel by way of the Straniger Alm. From the Cima di Lanza you then head on to the Trogkofel. This is the starting point for a fixed rope route which is only suitable for experienced mountaineers. This section can be bypassed to the south. The Rudnigsattel and Tressdorfer Höhe are the next stops before you reach Nassfeld. Here, cross the Nassfeldpassstraße and follow the path to the Alpenhof Plattner. From Alpenhof Plattner, you should follow the path making for the Watschinger Alm. The route then heads uphill to the Garnitzentörl and then on to the Garnitzenalm. A forestry path then leads to the Stubenboden and continues on to the Egger Alm. From there, follow a tarmacked road to the Dellacher Alm, or, alternatively, take the signposted Seerundenweg around the lake. From the hut, you should then continue on through the forest and pastures to the Görtschacher Alm. A walking path begins here which passes the crags of Starhand before continuing on to the Dolinzer Alm. This is home to the warm and inviting Gasthaus Starhand. From Gasthaus Starhand, walk the road towards Werbutzalm before turning off at the first hairpin bend in the forest. On walking path no. 507 you then reach the Feistritzer Alm and Gasthof Oisternig. The route then continues on to the Achomitzer Alm, past the Maria Schnee chapel. From there, a gravel track winds down to the Bartolo-Sattel. Head on through the forest to the Kapinberg. Keep heading east, down over the mountain pastures until you reach a forestry road, which takes you on to the Göriacher Alm. From here, you can descend down through the trees to Thörl. This tour encompasses a whole host of unforgettable spots offering quite astonishing panoramas of the surrounding mountains. The landscape is extremely diverse, never growing monotonous or boring. The Carnic Alps are also home to a fascinating range of flora. As the tour also leads up to some demanding summit routes, such as the ones on the Große Klinigat, Filmoorhöhe and Hohe Warte, you can also extend the tour by two to three days if you want to tackle the peaks themselves. The Filmoorhütte and Untere Valentin Alm are ideal destinations for additional accommodation in this respect. Sturdy footwear is a must on this route. As it’s a multi-day tour, you should pack clothing accordingly and be prepared for a range of different temperatures. Don’t forget to bring a sleeping bag for the huts either! By car: If you’re travelling from Germany, follow the A93 to Kufstein Süd. Take the B161 towards St. Johann and continue on to Pass Thurn (B108). Then head for Felbertauern and then Lienz. There, turn onto the E66 towards Sillian. If you’re travelling from the east, take the A10 to Villach. Exit onto the B100 at Spittal, which leads to Lienz where you can turn off to Sillian. By train: It’s also possible to travel to the starting point by train, as Sillian station is a regular stop on the high-speed rail network.